Both state regulators and a watchdog group backed away from legal action against Baltimore Scrap Corp. for discharging oil and other waste into city storm drains. What’s going on? On a gray, drizzly morning in March 2016, two inspectors from the Maryland Department of the Environment showed up unannounced at Baltimore Scrap Corp., a sprawling metal recycling facility located just south of the Harbor Tunnel Throughway. In a report written later, the inspectors described their visit as a routine check of the junkyard’s stormwater pollution controls. It was anything but routine, though. Following up on a tip from an environmental group, they ultimately wrote up the company for 11 violations after seeing sediment, oil and possibly other contaminants washing off the cluttered, debris-strewn site into city storm drains that eventually reach the Patapsco River just south of Fort McHenry. Nineteen months later, the case remains unresolved, even though documents obtained under Maryland’s Public Information Act show that follow-up inspections by the MDE found new and continuing violations – and the state considered imposing a $500,000 penalty. The case raises questions about Maryland’s vigilance in enforcing anti-pollution laws. Under the Hogan administration, MDE regulators have been opting more frequently to give violators time to fix problems, without fining them or hauling them into court. In 2016, nearly six times as many water pollution violations were handled through compliance assistance as were subject to formal enforcement action, an increase of 21% over the previous year, according to data sent to the Maryland General Assembly. For the subset of violations involving surface discharge permits, the number of compliance assistance cases jumped from none four years ago to 78 last year, more than the number of enforcement actions taken against such permit holders. That kind of forbearance bothers some environmental advocates, who complain it undermines the Chesapeake Bay cleanup by failing to deter polluters. “It’s like a cop watching cars speed by, and instead of ticketing them, he drives after them, pulls them over, gets them into conversation for an hour explaining all the dangers of speeding and then he lets them go,” said Rena Steinzor, an environmental law professor at the University of Maryland School of Law. In 2016, nearly six times as many water pollution violations were handled through “compliance assistance” as were subject to formal enforcement action, an increase of 21% over the previous year. And one of Baltimore Scrap’s competitors complains that it’s unfair to let such violations go unpunished for so long. “It just seems like a very uneven playing field when they can be as dirty as they are and not really paying attention to the environmental regulations,” said Paul Tharp, information officer for EMR Smith Industries, which operates scrapyards in Halethorpe outside Baltimore and in Capitol Heights outside of Washington. “MDE has not for a long time been cracking down on them [Baltimore Scrap] for anything,” Tharp said. In contrast, he continued, Smith’s Capitol Heights scrapyard paid Maryland a $12,600 fine three years ago after state inspectors found a minor problem with a storm drain filter at its facility. MDE spokesman Jay Apperson said that the Baltimore Scrap Corp. case remains an “active enforcement matter” as state regulators negotiate with the company and with the Environmental Integrity Project, the Washington-based group that initially tipped off state officials. Baltimore Scrap “has taken steps toward complying” with its permit requirements, Apperson said, while otherwise declining to provide information or making anyone at MDE available to answer questions. Company representatives wouldn’t speak at all. David Simon, Baltimore Scrap’s president, did not return phone calls seeking comment. Michael Lupco, the junkyard’s operations manager, declined to comment when reached by phone. The company’s lawyer, Todd Chason, also did not return a phone call seeking comment. Blue Water formally notified the company in early January of its intent to sue for serious and ongoing violations. The suit was never filed. Sylvia Lam, an attorney with the Environmental Integrity Project, wasn’t much more forthcoming when contacted, citing the continuing negotiations. Lam’s organization is representing Blue Water Baltimore, a local watershed watchdog group. 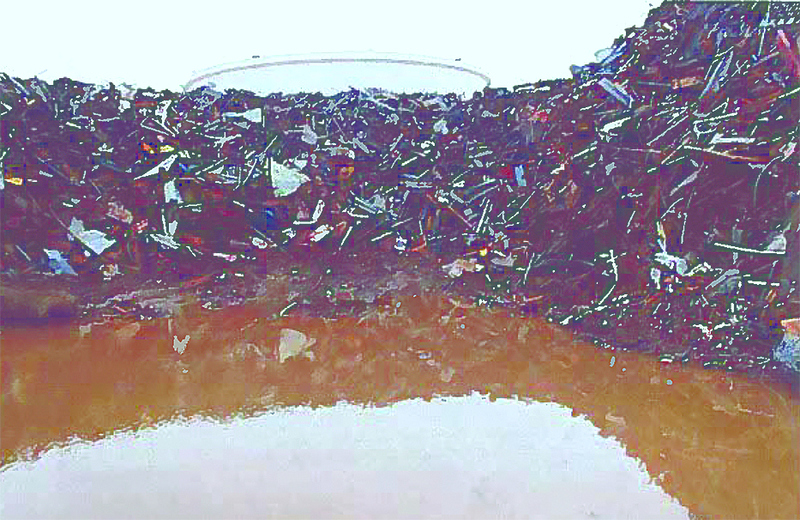 Nearly nine months after MDE inspectors found problems at Baltimore Scrap, Blue Water formally notified the company of its intent to sue for “serious and ongoing violations” that were allowing sediment and oily runoff to pollute the harbor – which is already impaired by sediment and heavy metals, among other pollutants. Despite the transformation of Baltimore’s Inner Harbor to an entertainment and tourist center over the last 50 years, industrial pollution remains a big concern, according to Haren. There are 47 wastewater plants and industrial facilities with permits to discharge into the harbor, as well as 423 other facilities which, like Baltimore Scrap, have so-called “general” discharge permits, according to an MDE online database. As the term suggests, general permits do not impose as many site-specific requirements on facilities, or subject them to the same degree of scrutiny as individual discharge permits. Only one in five facilities with any kind of water discharge permit got inspected in 2016, and the number had declined nearly 20% from the previous year, according to data in the MDE’s annual reports to the state legislature. Facilities with general stormwater discharge permits – like Baltimore Scrap – are expected to inspect their own runoff controls regularly and report their compliance annually to the state. Baltimore Scrap Corp. began operating on the southeast side of the city in 1991. 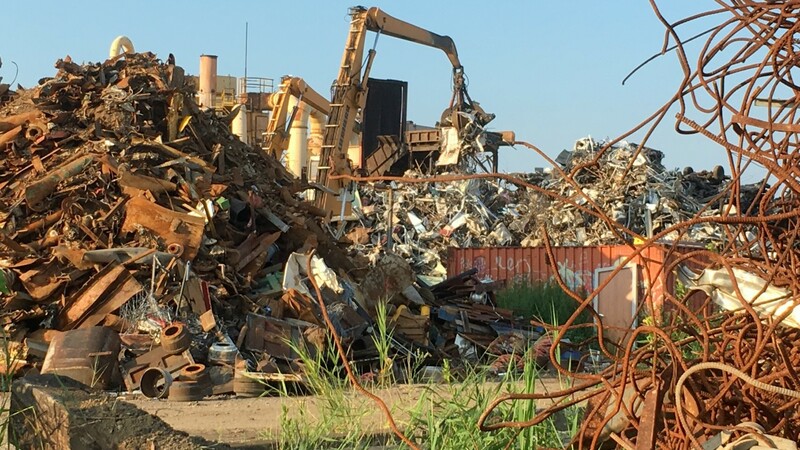 According to documents on file with the MDE, it buys scrap metal from industry, government, auto salvage yards, demolition contractors, farms and the general public. The facility operates five days a week, and sometimes on Saturdays, nearly round-the-clock. Before the MDE’s surprise visit in 2016, the scrapyard’s stormwater controls hadn’t been inspected since 2010, documents show. 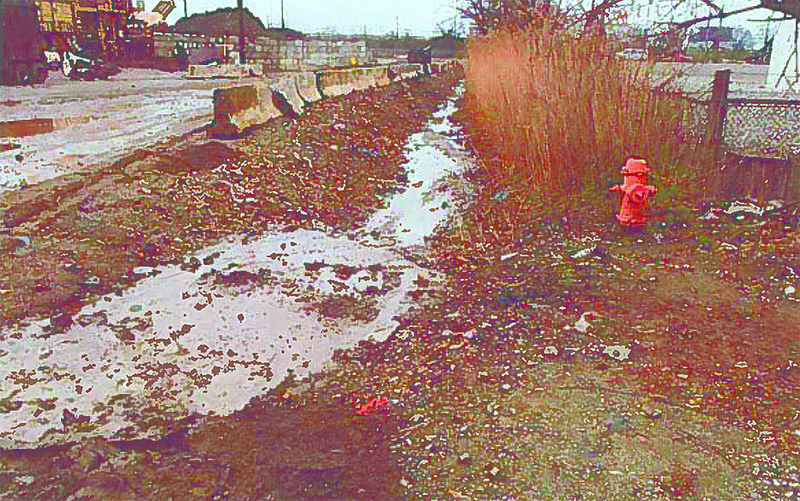 At that time, inspectors had written up the company for lacking a legally required plan for preventing and minimizing polluted runoff from its property. But instead of a fine, the company got “compliance assistance” and repeat visits from inspectors until it had developed a plan deemed satisfactory. • An oily sheen on stormwater flowing into a storm drain from an area where junked vehicles were stored. • “Fluff” from the shredding of non-metallic vehicle parts, such as dashboards and seat covers, scattered throughout the property, including in a drainage ditch. • A “dark, oil-like substance” in a drainage ditch that ran through the middle of the scrapyard. The inspectors cited 11 items out of compliance in all, including failure to perform required self-inspections and maintain records that the state uses to judge compliance. “We need deterrence-based enforcement, big tickets and big fines,” says UM’s environmental law professor Rena Steinzor. In April, and again in May of last year, MDE inspectors returning to Baltimore Scrap found that the violations initially detected were still largely uncorrected. Analysis of water samples taken from runoff entering the storm drains found excessive levels of metals that could potentially harm aquatic life. It’s not clear how much pollution the scrapyard may have released, because businesses with general stormwater permits aren’t required to monitor their effluent as closely as factories or sewage plants that discharge directly into streams and rivers. But stormwater runoff is considered a significant source of nutrient pollution of the Bay, and the only one that’s still growing as more of the watershed gets developed. Initially, the MDE seemed intent on acting swiftly after the follow-up inspections found continuing violations. In May 2016, Lynn Buhl, then MDE’s director of water management and now assistant secretary, wrote to the department’s deputy counsel urging formal enforcement action. She reiterated her request two months later after meeting with company representatives. They had outlined a plan for bringing the junkyard into compliance over time, but Buhl noted it lacked any schedule or timeline for resolving the violations. In August 2016, Buhl formally referred the case to the Maryland attorney general’s office for legal action. MDE’s files for Baltimore Scrap contain a draft legal complaint and consent order detailing violations found at the facility and spelling out a timeline for changes needed to correct them. The draft proposed the company pay a penalty of $500,000. The complaint and consent order was never signed nor filed, for reasons not spelled out in records that the agency provided to the Bay Journal. A spokeswoman for Attorney General Brian Frosh referred questions about the case back to the MDE. The letter listed five steps Baltimore Scrap had taken, including the “massive armoring” of a drainage swale that collected large volumes of stormwater from the scrapyard. A steel box had been installed at the end to settle out sediment and other pollutants before they could get offsite. Retaining walls were built that were meant to keep fluff and “residual fluids” on site. Storm drain inlets near the shredding equipment were raised and booms added to straw bales helped to prevent oil from being discharged. Chason wrote that the company had done everything it could in the short term and planned to hire an engineering firm for other, longer-range upgrades. “Baltimore Scrap looks forward to continued cooperation and coordination with MDE,” Chason’s letter concluded. That same month, the MDE conducted a “multi-media” inspection of Baltimore Scrap, including staffers responsible for regulating air quality, trash and hazardous waste and water quality. They found “several new control measures on-site” to prevent polluted runoff, but also saw oil spilled on the ground in a pool of stormwater near a pile of crushed vehicles. And while the site appeared cleaner, they said they still saw pulverized “fluff” from shredded vehicles scattered along the yard’s northern boundary, where it could get offsite. 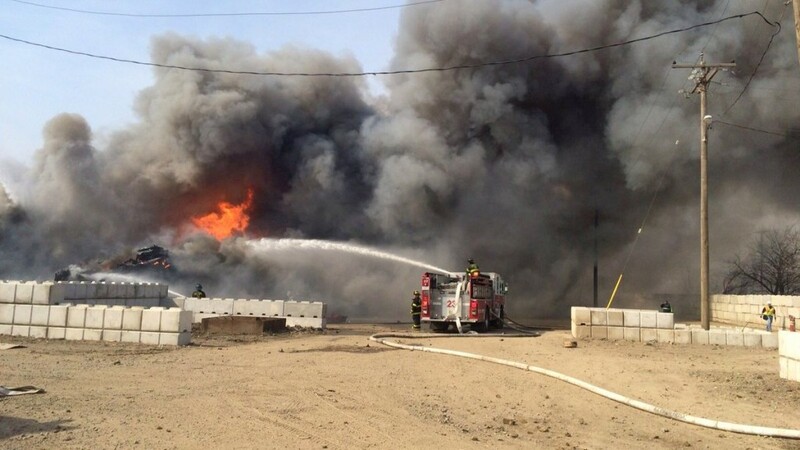 MDE inspectors also cited the company for violating its air quality permit. They said that company personnel were not removing all of the potentially harmful material from junked vehicles before putting them through the shredding equipment. Records kept of the pollution controls on the shredder indicated it was not always performing properly. Inspections in December 2016 and February of this year found conditions improved, but the company was still having trouble keeping the non-metallic fluff from blowing around, along with other litter and debris. Then, on March 24, a fire broke out at Baltimore Scrap, with billowing smoke visible for miles. Images posted on Twitter by the Baltimore Fire Department appeared to show a large pile of crushed cars burning. The blaze was extinguished after a few hours. Months afterward, the cause remained under investigation, according to a fire department spokeswoman. It’s not clear whether the MDE will wind up requiring Baltimore Scrap to pay a penalty for its violations, or whether it has used the threat of legal action to get the company moving toward compliance more quickly. Even if that is the case, Steinzor, the Maryland law professor, argued that it’s a financial benefit to companies to be able to delay coming into compliance, as well as a misallocation of the state’s limited inspection staff to spend so much time repeatedly visiting one wayward industrial site. Executives of Smith Industries, Baltimore Scrap’s competitor, said that they are spending significant sums to comply with environmental requirements. At its Capitol Heights junkyard, spokesman Tharp said, the company allocated $3 million to pave the entire site to help capture runoff. (Baltimore Scrap’s site is only partially paved.) Kelly Boyle, the company’s environmental compliance officer, estimated that Smith spends $100,000 a year on monitoring and testing. “Obviously, if you’re not spending money on elements of stormwater [prevention], that’s money you can put in your pocket,” said John McGarvey, a Smith vice president who manages the company’s Halethorpe yard. Jenn Aiosa, Blue Water Baltimore’s executive director, said ongoing negotiations prevent her from discussing the Baltimore Scrap situation. But she suggested it was not an isolated case. With nearly 27,000 permits or licenses to monitor, the department had 41 inspectors assigned for all of its water programs. Fourteen positions were unfilled in 2016. Lawmakers responded by designating $200,000 for this fiscal year to be spent on filling vacant MDE compliance and enforcement positions. – This article is published with permission from The Bay Journal.